I’ve recently made efforts to start rebuilding my website and work on my YouTube channel. I’ve also created other things such as a CV and a LinkedIn page which I hope to link to business cards I’ll also design soon. These efforts are part of Professional Practice, one of the modules for this year. My aim is to rework existing professional sites I have and to link them in with new ones. During the graduate showcase I want to have a strong portfolio, site and brand that I can advertise to interested people. Considering my display for the graduate showcase is important as the display is worth 40% of the module mark (the other 60% being this blog). While I’ve certainly give thought to the display, I haven’t properly talked about it so this is what this blog post will be about. Each student shares a display area with another student. 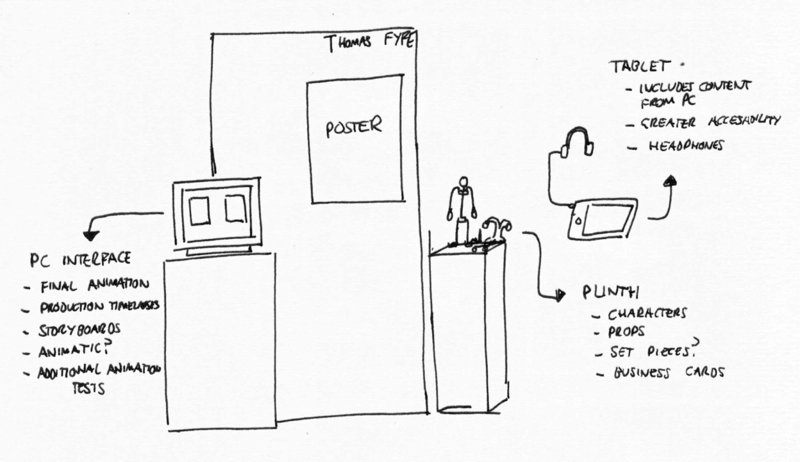 The booth consists of a computer where members of the public can interact with to view work via an interface. There is also a poster displayed and I’ve also requested a plinth in order to display the physical artifacts of the project. My plan is for the computer interface to host my final animation as well as insight into the production process. I will likely include the timelapses I’ve created, probably edited together into one video file. I may also want to include some of the practical animation tests and experiments I’ve created throughout the semester. I will find out more about how to populate the interface at a tutorial session later in the week. From there I will work out what content I want to include on it. My hope is that if I am provided with a plinth I will be able to showcase my armature character, a few props and maybe even re-create a part of the set. The plinth would also be a suitable spot to place business cards. In addition I will also bring along my iPad tablet which I will load on the same digital work so that its easier to pick up and show people which will be useful when the computer is in use with the other students work. The grad show display requires an A2 poster to be created and displayed alongside the work. As my final project outcome is a short film, it makes sense I’d look to create a movie poster for the work. I earlier planned to make a start on this poster once I began animating so that I’d have a better understanding of how my animation will look. I will gather some inspiration from other movie posters in the near future and look at how other stop motion animators have presented their work in similar situations.